1. Interrupted suture is potentially less ischemia producing. 2. 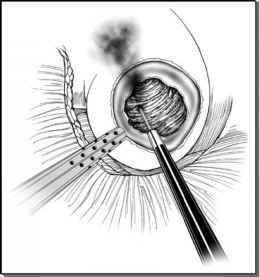 Correction of unevenness in the anastomosis is easier. 3. A running anastomosis can be compromised by an air knot, and could require redoing the entire anastomosis. Clipping stay sutures to cut edges of the peritoneum can facilitate suturing the anastomosis. This frees up both of the surgeon's hands for suture placement and obviates the need for an assistant to assist with the anastomosis. Anderson-Hynes dismembered pyelo-plasty is preferred when pelvic reduction may be necessary, a renal calculus is present, or a crossing vessel is encountered.